The Buick Terraza did not get the chance to receive much love from the public due to its short production period. 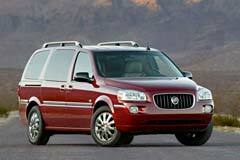 Since it was discontinued in 2007, the only way to acquire a model is to buy a used Buick Terraza. During its two year production period, the model was made available with a 3.5 or 3.9 liter engine. The 3.5 was capable of an output of 200 horsepower while the 3.9 went up to 240 horsepower. All engine options were paired with a 4-speed automatic transmission with a front engine setup and front-wheel or four-wheel drive. The exterior design was fairly typical for a 4-door minivan. It featured a large front bumper with a small air vent, large rectangular headlights, small round fog lights and a tall but not so wide grille. For the American car manufacturer, the Terraza was the first minivan introduced in the U.S. In the last production year, Buick introduced the flex-fuel version and dropped the 3.5 liter engine option with the 3.9 one being the new standard.